Istanbul is a huge city. Visitors from abroad tend to concentrate on the Sultanahmet (Blue Mosque) area of the old city, and the shopping/entertainment neighbourhood of Taksim/Beyoğlu. The modern expansion of the city began in the late 1960s when the population was around two million. Now the official count is 13.5 million, but, as with other cities in the megalopolis class, a lot depends on where you draw the boundaries. In the 16th century, at the peak of Ottoman power, the imperial capital of Istanbul/Constantinople was still enclosed within the 22 kilometres of defensive walls built by the Roman emperor Theodosius II in the 5th century. Nevertheless there was, in addition, much activity outside. The satellite settlement of Galata across the Golden Horn continued its role as trading centre and residential suburb for non-citizens of the empire: Venetians, Genoese and other Europeans drawn by the magnetic attraction of this gateway to the East. The town of Scutari/Üsküdar on the Asian shore served as launching pad for the pageantry and adventure of annual pilgrimages to the Muslims' holy city of Mecca. 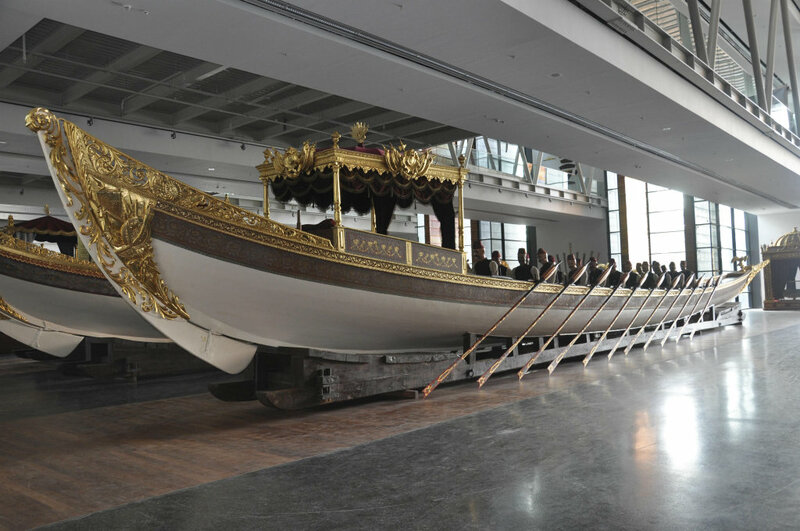 The Ottoman navy, scourge of the Mediterranean littoral, had its main base, shipyards, cannon foundries and other associated industries on the northern shore of the Golden Horn and around the corner as far as the Bosporus village of Beşiktaş. Despite the exponential growth of Istanbul's population and fears, or at least claims, that the present government of Turkey has been trying to recreate a neo-Ottoman sphere of influence, those glory days of empire are long gone. Passenger ferries and other small craft were still being built in the Golden Horn shipyards in the 1980s, and repairs carried out in the dry-dock until more recently - but the decision has at last been taken, as in London and other world cities, to find new uses for the disused docklands area: a hotel or two, modern shopping no doubt, recreational facilities such as parks and cycleways. You can observe the pattern in Liverpool, Gloucester, Melbourne, Australia, even my own home town of Auckland, New Zealand. Of course those docklands areas contain much of their cities' heritage, and sensitive redevelopment must include preservation of buildings with historical significance, perhaps adapting them for modern purposes such as up-market apartments, museums and art galleries. One advantage of such urban renewal is that it brings new life and visitors to parts of a city that may have been neglected no-go zones for many years. One such area of Istanbul is the neighbourhood of Kasımpaşa. The new President and former Prime Minister of Turkey, Recep Tayyip Erdoğan, continues to attract more than his fair share of criticism, and one sticking point for some modern Turks seems to be that he was born and raised in this ‘mahalle’ which, if there were a railway track nearby, would definitely be on the ’wrong’ side. For his part, the PM seems quite proud of his humble origins – and they may arguably contribute to his popularity among the less exalted echelons of Turkish society. On Sunday I ventured, in the company of a Turkish friend, into the interior of the ‘hood in search of a mosque I had seen from a distance, but never visited. Perhaps it’s a measure of the status of Kasımpaşa that the taxi driver we hailed to drive us had no idea about the location or even the existence of Piyale Pasha Mosque, and dropped us off within sight of another one nearer the waterfront – or perhaps, on reflection, he was nervous about plunging too far into unknown territory. By dint of asking directions and walking a kilometre or so, we did eventually arrive at the building we were seeking – a large 16th century stone edifice set in an uncharacteristically (for Istanbul) green area of fig trees, walnuts and market gardens. There is some mystery about the building itself, in part because its design is also uncharacteristic of mosques of the Ottoman Imperial period. The general rule, modelled on the great cathedral of Hagia Sophia, is a large single dome covering the inner sanctuary – but Piyale Pasha, or his architect perhaps, reverted to an earlier design with six smaller domes supported by two granite columns in the prayer area. Most sources credit the mosque to the architect Sinan, shining star of Ottoman architecture – but the unusual design leaves some room for doubt. Piyale Pasha himself seems to have been an interesting character, not least because he chose to locate his memorial mosque far from the capital’s commercial and residential hub. Sources say he was of Croatian origin, captured (in battle?) and brought to Istanbul at the age of 11 where he was then educated in the palace itself. He went on to become a provincial governor and later an admiral in the imperial navy, testimony to the eclectic and meritocratic nature of Ottoman society at the time. Surprisingly, Piyale Pasha is not well known, even in Turkey, despite marrying the daughter of Sultan Selim II and becoming his grand vizier. 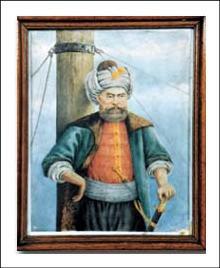 His fame is overshadowed by older colleagues, Barbaros Hayrettin Pasha and Turgut Reis. Nevertheless, he seems to have achieved considerable success in his own right, his raids on coastal towns of Italy and Spain forcing Christian states into some semblance of unity to defend their territories. 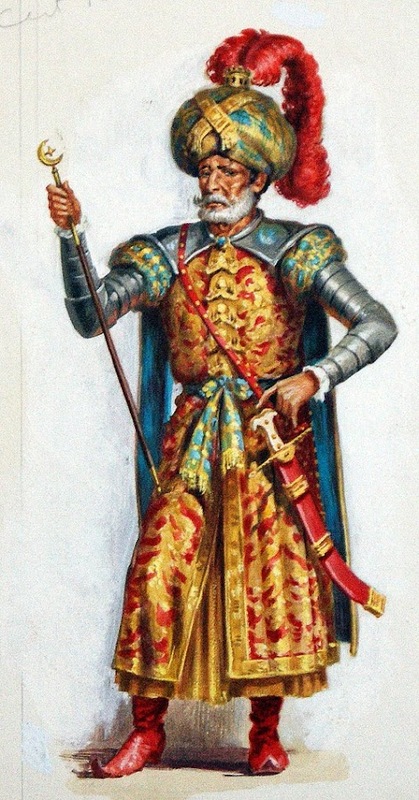 Ottoman forces in the second half of the 16th century came to control the Aegean and much of the Mediterranean, including the North African coast and the strategic island of Cyprus – which, incidentally, they seized from the Venetians, not the Greeks. Perhaps Admiral Piyale suffers from his close association with a sultan often considered to have begun his empire’s downward slide. Certainly Selim II had a hard act to follow. His father, Suleiman, known in English as the Magnificent, ruled for 45 years, and is generally regarded as having presided over the Ottoman Golden Age. During his son’s 8-year reign, on the other hand, Ottoman forces suffered major setbacks against Russia, and Christian Europe at the Battle of Lepanto. Selim apparently had a reputation for enjoying a tipple, and one of his achievements was reopening bars and meyhanes closed by his father in the later years of his rule. The Wikipedia entry asserts that the unlucky sultan died as a result of a head injury sustained when he fell in his bathroom after a session of over-indulgence. Well, maybe that’s one reason why PM Erdoğan has some reservations about the benefits of drinking alcohol. Certainly, when he breaks a bottle of sparkling grape juice over the 3rd Bosporus Bridge in the opening ceremony, he will want to make it clear that the structure will be named for Sultan Selim I and not Selim II. In a more serious vein, I noticed, when visiting Admiral Piyale’s mosque, recently renovated, that the mihrab (sacred altar) is beautifully decorated with ceramic tiles, and high on the walls runs a lengthy Koranic text in elegant Ottoman/Arabic calligraphy – while the rest of the walls and interior of the domes are uncharacteristically plain. Several articles I read stated that interior decoration had originally been more elaborate. They also noted that the mosque had been extensively rebuilt in the 19th century. Reading between the lines, it would seem that there was a time when Piyale Pasha Mosque fell into disuse and disrepair, and perhaps prey to theft and desecration. In fact, while roaming around the Internet on this subject, I came across this item up for auction at Bonhams: ‘An Iznik pottery tile, Turkey, circa 1575, Provenance: Greek private collection. Well, it’s none of my business. I’m happy that Parisians and other visitors to the Louvre have the opportunity to see such examples of high Ottoman art – and if it helps them to a better understanding of their Muslim neighbours, perhaps the tiles should stay where they are. Alan first came to Turkey in 1995. From the first he was captivated by the country – the incredible layers of history, the diversity of cultures, the music and the legendary hospitality of the people. Since then he has spent most of the intervening years living and working in Istanbul as a teacher of English. He lives in that Queen of Cities with his Turkish wife, Dilek; visits regularly an ever-increasing whanau in Australia, New Zealand and the USA; writes a blog about Turkey; rides a bicycle, and escapes to Gümüşlük whenever the opportunity arises.